I attended a craft beer “dinner” a few weeks ago. It was a splendid affair, with multiple courses paired with craft beer and accompanied by elaborate explanations from a distribution rep and chef on the fermented delights and cuisine. It had me thinking about the progress that’s been made … and how far we have to go. American wine, especially California wine, made its mark in the vintner world when their varietals started besting France’s finest offerings in blind tastings. U.S. finally reached the masses, however, when Gallo started pitching cheap hybrid blends like “white” zinfandel (for those who don’t know, a zinfandel is actually a redgrape). As people discovered they liked wine, and it was approachable, affairs like wine dinners, tastings and food pairings became the norm for restaurants to the point where, by now, even Applebee’s offers suggestions on their menu. We’re not quite there with beer yet, but we are making progress. 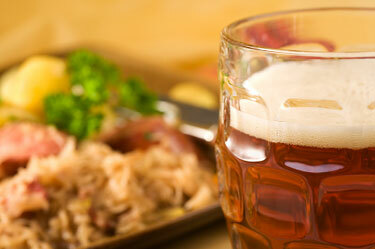 BeerDorks offers food pairings as a matter of course, based on the style of beer in the reviews on these pages. Many taphouses, brewpubs, and restaurants are starting to compliment their entrees with craft beers and offering brewmaster dinners, such as the one I attended recently. More and more bars are realizing they MUST offer wider beer selections—even if too many resort to the pseudo-craft beers offered by Michelob, Coors, and other big players. High-end restaurants have long employed one or two sommelier—a wine master—to manage their wine cellars and offer pairings to their well-heeled dinner guests, with certification programs since the late ’60s that have recognized nearly 200 Master Sommeliers worldwide, as of 2009. Now, there is a Cicerone Education Program for the beer industry and the U.S. is truly leading the way. Exam levels range from Certified Beer Server to Certified Cicerone and Master Cicerone. Currently, one person in the world has passed the Master Cicerone test: Andrew Van Til … and he just happens to reside in Michigan. There are well over 100 Certified Cicerones, and the vast majority of these experts are American as well (which is understandable, as the certification board is in Chicago). With wine, it took a mass market appeal of an everyman wine to reach the general population, who learned over time and experimentation to appreciate—and pay for—quality over the past four decades. With American beer, the industry has long reached the people … and they’re beginning to appreciate and support quality as well. The world of beer is evolving at a pace faster than at any other time in history. The world of beer is rapidly evolving, at a pace faster than at any other time in history. There are three traditional brewing centers in the world. The Germans have staked their claim on their malt and yeast microbiology. Their brewers are all formally trained and amazing at what they do. The English have cultured a reputation for hops, spices, and fervent supporters of Real Ale. The Belgians have evolved slowly and maintained many of their traditional brewing practices, rich in variety and flavors. I would submit that the corner is being turned and there is no place richer in creativity, excellence, and excitement than the United States. Our job is to experience, support, and enjoy it.